How did you get your ADNS service to listen on both public and private IP addresses? The ADNS service is automatically replying with DNS requests to both public and private IP addresses. I’m keen to understand, if you had a PAT\NAT setup from the Public IP (for ADNS services) to your ADNS listener service running on Private IP? Thanks for the insight, good blog! Yes I have a static 1:1 NAT to the private IP of my ADNS listener. You also use this scenario if you do Active-Passive GSLB same configuration but you change the weight of the GSLB services. What IP the NetScaler gives out, you manage by DNS views what view matches to your policy. That is also the reason why you configure a public IP in the GSLB service configuration, the ADNS listener replies per default then always with the public IP until a DNS view changes this. 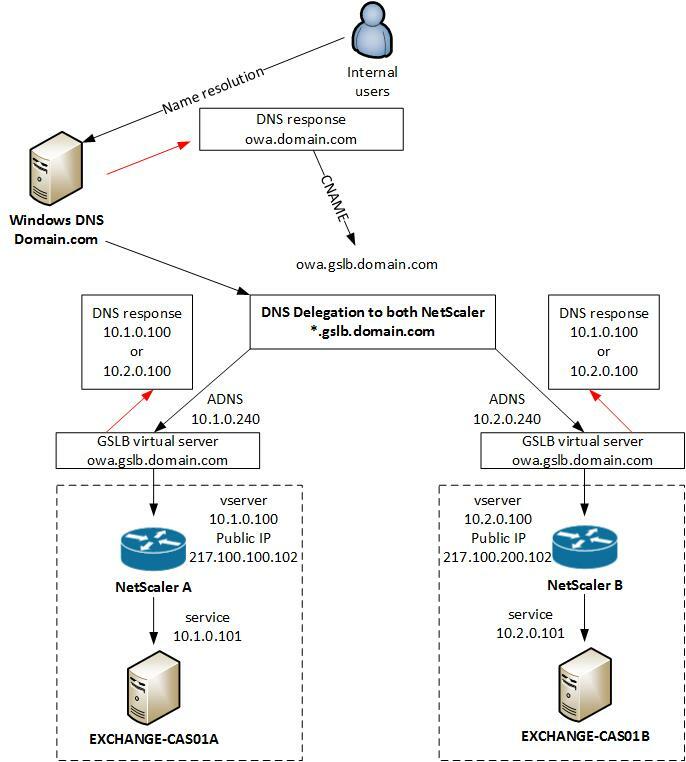 Yes this works both, GSLB is in the end DNS based and redirect you to the right virtual server on the NetScaler and keep you persistent there. Sorry if this has been answered before. If an external client request resolution and gets an IP of 217.100.100.102 which it proceeds to cache. If site A goes down is there a mechanism for the client to be warned to stop using the cached IP and query again? I understand that when it queries again it will get the IP of site B.
I can think of really low TTL as one mechanism. This is always a problem with GSLB because it is DNS based and client caching could result that the requests hitting the wrong datacenter. How to get round this, is a short TTL as you said, Default is 5s if I remember correctly. The Citrix NetScaler has another cool feature to redirect/tunnel the request to the right location if you have an existing session somewhere. It keeps a global connection table and if you’re hitting the wrong location your connection is internally forwarded to the NetScaler u were using before if there is no fault. But if a site goes down completely your tcp sessions are broken and you need to rely on a short TTL as mentioned and that your application recovers automatically, for MS exchange and Outlook this is very seamless but normal website this maybe less good. But overall GSLB is a good way to equally distribute your traffic and for site redundancy. I understand. Thank you for your response and for the great article.